Atlas Geographicus portatilis XXIX mappis orbis habitabilis regna exhibens ... Kurzgefasste Geographie - LOTTER, T.C. Title : Atlas Geographicus portatilis XXIX mappis orbis habitabilis regna exhibens ... Kurzgefasste Geographie. Size : 5.7 x 4.5 inches. / 14.5 x 11.5 cm. Description :Pocket atlas of T. Lotter and T. Lobeck. Bound with "Kurzgefasste Geographie" of Lobeck. With one world map, one celestial map, 4 continents and 37 european maps including 14 maps of Germany not mentioned in index. 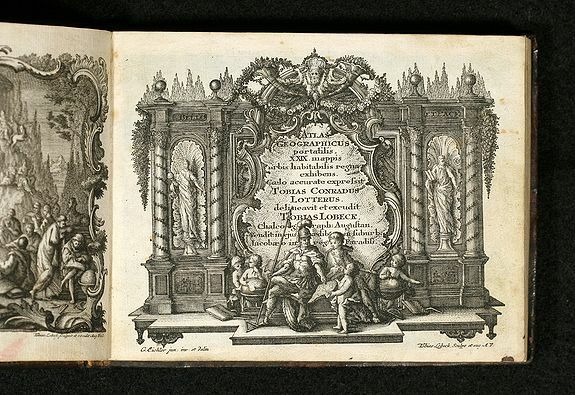 Engraved title and frontispiece. Condition : Slightly browned. Cover: Contemporary full leather binding. Overall excellent conditions.